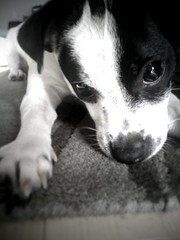 Those of you who know me, capsule know that I have a rambunctious puppy named Mussels. Why Mussels? Well, advice we wanted to name her something food-related and she was the runt of the litter. We thought Mussels would be funny. Little did we know, diagnosis Mussels is the perfect name for a 10-pound terrier who thinks she’s a 90-pound Pit Bull. She sure is cute though! Another reason for the name: we love mussels. You know, the bivalves. They’re briny and tender and are usually accompanied by a slurp-worthy bowl of broth. And this broth was definitely worth slurping. Coconut milk and curry paste, cilantro and lime. It was even better than the chorizo-infused broth I usually make. You know it’s good if I prefer it to chorizo. Set a really big pot** over medium heat. Once it’s hot, melt the butter and saute the shallots for 5 – 7 minutes, or until they begin to turn translucent. Add the curry paste and half the chicken stock. Use a spoon to break dissolve the curry paste into the stock. Add the rest of the stock, the coconut milk, cilantro stems, sugar, soy sauce, fish sauce, lime juice and coriander. Bring to a simmer and cover for about 5 minutes. Taste and adjust the seasoning as needed. Raise the heat to medium high and add the mussels. Toss the mussels in the broth, then cover and let steam for about 5 minutes, checking to see when they open. Remove each mussel once it’s open to make sure you don’t overcook them. Some may not open and those should be discarded. When you’ve removed all the mussels, serve them in bowls and add a few generous ladlefuls of broth. Sprinkle with cilantro leaves. *A mussel’s beard is a small bunch of fibers sticking out of the shell in one place. Give them a hard tug with a pair of pliers to remove the beard. This looks fantastic, definitely have to try this. I’ve never had mussles before, but I love Thai food. And your pup is adorable! You had me at red curry paste and coconut milk, two of my favorites. Another good, clean, combination, but a bit spicy is sliced jalapenos, a bit of stock, and live mussels. Good work. Yummy. This recipe looks great. I always make mine the traditional french way moules mariniere…. but this looks perfect for a change. Lovely! I do, I do love mussels! I appreciate your preciciment, chorizo vs. curry….. it’s a tough one. This sounds like exactly what I’ve been looking for… all of my life. Who me, dramatic? Thank you so much for the recipe. I really will be trying it and enjoying it very soon! 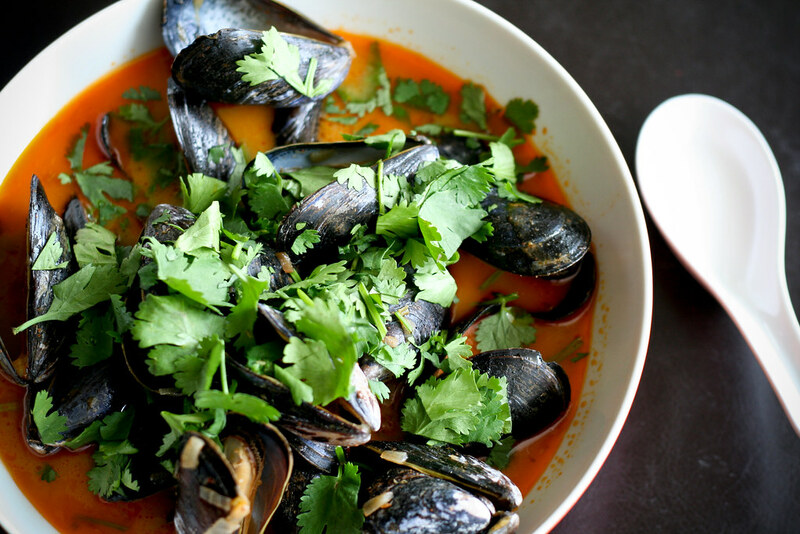 Love mussels and Thai style curry! I will definitely try this. Mussels the puppy is very cute and I love his name. I made your tomato/goat cheese tart last week for a party and it was a big hit. These look scrumptious! I’m always surprised at how easy it is to make mussels. Yum. That looks AMAZING — love that flavor combo, and I never met a bowl of mussels I didn’t like. And that is the sweetest little puppy face!!! This looks and sounds so delicious. As does the goat cheese/heirloom tomato tart, nice job! I made your buffalo/sweet potato pizza last week, it was a HUGE hit. Thanks! Love the pup! I just came across you web site and I love it. But I must admit, I was intrigued by the name. You might have heard this before but check out a band called The Dead Milkmen. They have a song by the same name “Bitchin’ Camero”. This looks beautiful and I love the idea of mussels and thai flavors. Your pup is super cute too! I recently launched my own blog, I’d love for you to check it out and let me know what you think! :) Thanks! Great recipe–been looking for a good one. I adapted it for shrimp & worked great! Thanks! Just made it – awesome recipe! I used a little less coconut milk, added roasted butternut squash and some shrimp to make it into a full meal. It was amazing! Thanks for sharing – love your work! can i just say that my boyfriend and i have made this recipe that we found on your site over 10+times?! we absolutely love it. we live in Boston, and have good seafood constantly available. this meal something we have at least once a month. thank you thank you thank you for the creating/posting our favorite dinner. i told you we love your mussels. we were finally able to do a blog post on your recipe! hope you have time to check it out.